After the shootings in San Bernardino, Ca., earlier this week, local leaders gathered at the Muslim Community Center in Silver Spring, Md., to pray for the victims and call for a united peace effort. 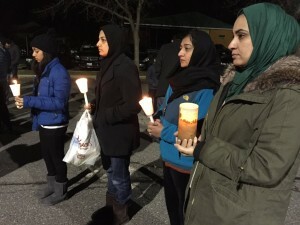 SILVER SPRING, Md.– A candlelight vigil in Silver Spring, Maryland, honored the 14 people killed in San Bernardino, California, earlier this week. Held at the Muslim Community Center, Muslim and non-Muslim community leaders gathered to pray for those affected by the attack and to call for a united peace effort. Shahan Rizvi, the president of the Howard County Muslim Council, asked the Muslim community to put pressure on politicians, for everyone’s safety. “We as Muslims need to lead this conversation and demand that our government institute better gun control mechanisms to safeguard our humanity,” Risvi said. Prince George’s Muslim Association Imam Ahmad Azzaari echoed a concern of many Muslims around the world. Despite efforts from others like Azzaari and Rizvi to keep the Islamic religion separate from the recent attacks and “radical Islam,” anti-Muslim incidents are on the rise nationwide. In Northern Virginia, Manassas Mosque received a phone message on Thursday from a caller threatening to retaliate against the mosque if any of the San Bernardino victims were found to be Jewish. The caller claimed to be with a radical Jewish nationalist organization. This is not the first time Manassas Mosque has been targeted. in 2014, the outside of the building was vandalized. In Fairfax County last month, a 27-year-old man caused $200 worth of damage to the Dar Al-Hijrah Islamic Center in Falls Church, Va. He left a hoax explosive device at the mosque as well. On Friday, Rep. Don Beyer, D-Va., Del. 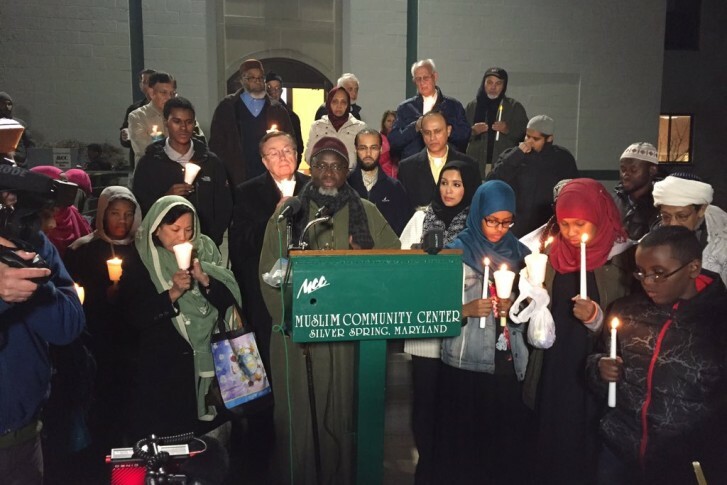 Eleanor Holmes Norton, D-D.C., and other elected officials attended a service at the mosque. Nasreen Rahman, the vice president of the Baltimore County Muslim Council, appealed to non-Muslims, asking them to not look at Muslims in the community any differently than before. WTOP reporter Michelle Basch contributed to this report.